An earlier version of this article had ARC playing Lassen College in the caption. In fact, the game being played in the picture was against Hartnell College. 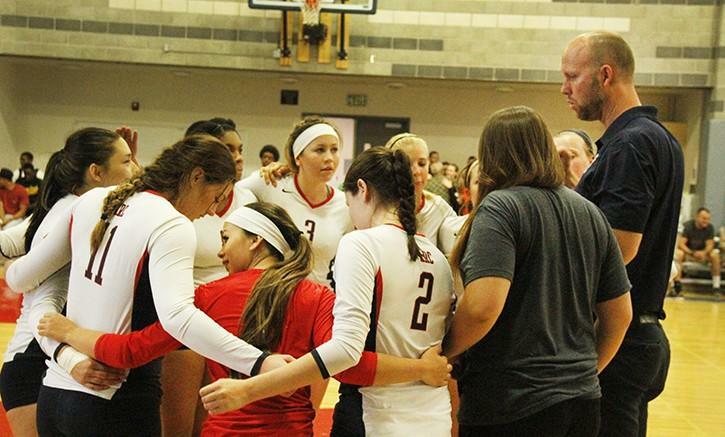 For American River College’s new women’s volleyball coach and Olympic gold medalist Gabe Gardner, pressure isn’t a new thing. Gardner won a gold medal the 2008 Summer Olympics in Beijing as part of the U.S. men’s volleyball team. He also competed in the 2004 Summer Olympics in Athens. “It’s nice to represent your country, which is bigger than any of us (and) more important than any school or university that I’ve played for,” said Gardner. Competing in nine other major international competitions, Gardner faces a whole new challenge as he takes over for Ashlie Hain, who is now the head coach at University of California at Irvine. He has become a part of a program that has experienced sizable success in the past. ARC has made it to the regional semi-finals in three of the last five years and the state quarter-finals in 2013. “It’s a feather in our cap to have somebody that has a really really great reputation in the volleyball world. It certainly can’t hurt,” said Bruce Werner, the interim athletic director. Gardner said he understands the expectations year-to-year are high, but knows that the adjustment for everyone will be part of the learning process. Gardner noted the difference between being a player and a coach, but said he is happy to be coaching. “It’s easy as a player to really feel all the emotion and drama of the match and to be overly emotional or over invested in one play or one set,” said Gardner. Right of the bat, the difference between Gardner and Hain has been noticeable to some of his colleagues. Kathy Sullivan-Torrez, a physical education professor and ARC volleyball coach from 1992-2005, said that the school is very excited to have Gardner on board. “It’s exciting for our department and our players and he brings a wealth of experience at many different levels,” said Sullivan-Torrez. Gardner stepped into the role in late July and only had a week before start of the preseason. Even after two months, the team is still transitioning into the new system. “Speaking with the girls, they’re looking forward to going to practice,” said Sullivan-Torrez. “(Gardner) gets in there and plays with them sometimes and I think that they like that,” she continued. Freshman middle blocker Erin Fogarty recounted past practices where Gardner had got on the court and played with the team. Freshman outside hitter Candice Reynoso said the team has really come together under Gardner. “The team feels very homey, we’ve all bonded quickly,” said Reynoso. As for why Gardner came to ARC, Gardner said that familiarity and competitiveness played a big role in his decision. “I coached with Ashlie Hain before. We coached a club team together so I’ve been exposed to the campus,” said Gardner. “I think it’s a competitive team so I wanted to be here,” he continued. Be the first to comment on "Gold medalist steps into new role"